It took the entrepreneurial instincts of Fiona’s husband, Kishore Patel, to fully appreciate the potential of a bakery business in which her rigorous standards, insistence on ingredients and decoration of the highest quality would be the guiding principles. Now encouraged, Fiona took samples to The Conran Shop and immediately received an order for 72, which she later learned, had sold out within hours. 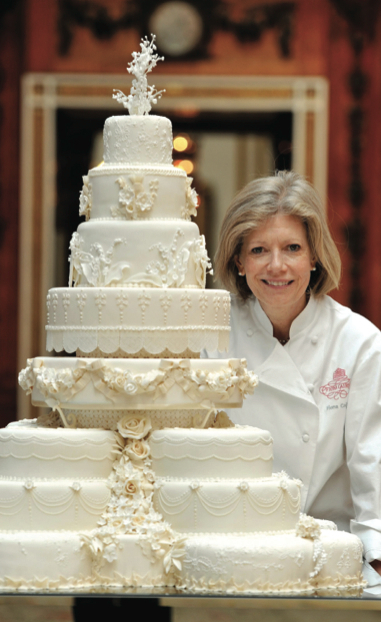 Twenty six years later, in mid-February of this year, Fiona received a phone call from Clarence House and the invitation was to produce the Wedding Cake for His Royal Highness, Prince William of Wales and Miss Catherine Middleton. Miss Middleton, had long admired the style of cake decoration pioneered by Victorian baker, Joseph Lambeth. His beautiful cakes smothered in flowers so perfectly formed from icing sugar that only close scrutiny could reveal that they were not real. Choosing Fiona and her team to produce such a cake acknowledged the years of practice and training that ensured, probably uniquely, she could be relied upon to produce a cake that would be perfect and literally, fit for a King. Nine weeks later, there it was, eight tiers of immaculately decorated delicious fruit cake, standing on a smoked glass plinth in the Picture Gallery of Buckingham Palace, attracting the highest praise from 600 very discerning guests. The Times called it a ‘masterpiece’. It is apparent that The Royal Wedding cake will be the defining achievement of Fiona’s career, as interest in her and in the business pours in from all over the world. Nevertheless, the core of the company remains the same as ever. Hundreds of thousands of fairy cakes and biscuits are produced for major stockists every year. Brides to be will still be able to order their own wedding cakes from a range of designs exclusive to Waitrose. Customers of Waitrose, Harrods, Fortnum and Mason, Sainsbury’s and Selfridges will marvel at the beauty of the cakes and, offering them to guests at home for tea, will receive praise in their judgement at having chosen so well, such praise being as well-founded as that received from Fiona’s friends, around her table back in 1985.